Naan is a North Indian dish. So very famous that it is found in almost all the restaurants of India. Many people do not try this at home as they think to make naan they need either oven or tandoor. But this is not true and naan can be made using tawa also. Very simple just like a chapathi :). Naan can be loaded up with various kinds of toppings like chopped garlic, Onion seeds / kalonji / nigella seeds, fresh coriander, cilantro, cumin seeds, fennel seeds, poppy seeds, nuts and raisins, butter etc. You can choose among these as per your choice. I love garlic and cumin toppings so i am showing you garlic and cumin naan. The dough must be very soft. It should stick to your hands. Can use 2 tbsp melted ghee / butter for 2 cups of all purpose flour / maida while making dough. Can place the dough in refrigerator if you would like to make the naan later only after it has completed the fermentation process (Dough rise). Can replace cumin or garlic with fresh corinader, nigella seeds, fennel or poppy seeds. 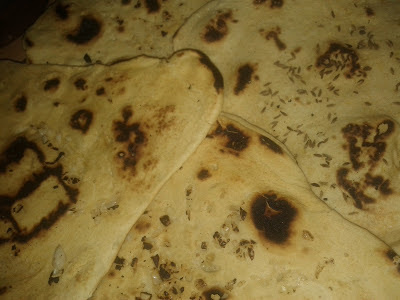 Can make naan with maida / all purpose flour or wheat flour. Can also have plain naans without any toppings and butter if you like it to be simple. Instead of 2 tbsp yeast, we can use 2 tbsp baking powder / baking soda (2 cups all purpose flour / maida = 2 tbsp yeast). 2 tbsp yeast = 2 tbsp Baking soda. For 2 cups all purpose flour / maida, add 1 egg or 1 cup yogurt at room temperature. In a bowl, take warm water, add yeast or baking soda and sugar into it. Close and keep it aside for 10 minutes. Now for that add melted butter / ghee, all purpose flour / maida, egg or yogurt. Knead well. Add little yogurt / curd at a time to make a soft dough. Put this dough in an oven for 30 minutes (the light inside the oven will generate heat and help in the process of fermentation). After 30 minutes, you can see the yeast has made the dough to rise. Now apply little oil / flour on your palms to make the balls and leave it covered for 15 minutes. Once again you can see the dough to be risen. Now roll the balls into a flat round shape to form a chapathi or teardrop-shape. Heat a big pan / pot with the lid on high flame. When smoke starts to come out, patt naan with water and put it in pan and cover the pan with lid. Bake flip on other side when you see bubbles. Spread butter on top if needed and serve hot with any gravy.